We all agree a slow WordPress admin panel can be a massive pain in the neck. It affects your productivity in ways more than one. It affects the site’s performance, it gives you a headache dealing with it and so on. Now let’s delve into how to fix slow WordPress Admin Panel. 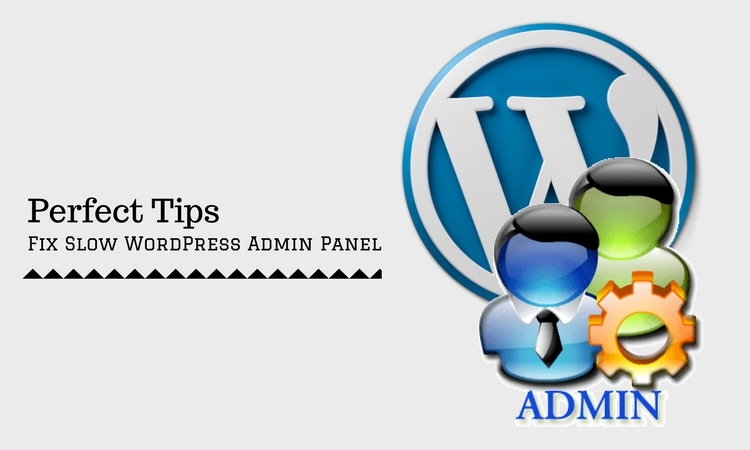 One of the major reasons that cause a slow WordPress admin panel is the installation of a high number of plugins. Having a lot of plugins leads to conflict on the site, and thus adversely affects its performance. Now there are two ways to deal with plugins if they’re the reason for your slow WordPress Admin Panel. Start by disabling any unused plugin settings that you may find. Go through all your plugins’ settings and keep turning off the ones that you feel are unused and can be turned off. This lowers the CPU utilization and thus makes your site faster. The plugin settings that when turned off will show you good results are those that might be run ongoing scans or providing statistics, sending notifications. While on the topic of plugins, inactive or unused plugins also tend to affect the performance of the site by adding to the load time. So if you have a plugin that’s not in use anymore, it’s best to delete it completely. For this, go to the plugin menu, open the tab containing inactive plugins and delete. W3 Total Cache is a very useful plugin, but at the same time, it is also a very overwhelming one. It provides the user with a huge number of settings to configure, which makes it very efficient, but at the same time, it makes it rather confusing for the uninitiated. As beginners, most of us make the mistake of believing that the more the cache the better. But as any experienced WordPress Developer would tell you, that isn’t necessarily true. So, if you’re using W3 Total Cache, disabling the object cache is a good way to fix your slow WordPress Admin Panel. Just go up to the General Settings and disable object cache. Your database houses Trash Folders, Spam Folders, Transients and thousands of post revisions. Storing this data is rather unnecessary. There are multiple plugins to choose from, like WE-Optimize, WP Rocket, Pippins etc. Now, we’re not saying this will completely fix your slow WordPress admin panel problems, but having a regular clean-up will help run your site in a smooth manner. Content Delivery Network (CDN) is a structure of distributed servers. These servers distribute Web content depending upon the geographic locations of the users, the source of the data and the server. Now, MaxCDN and Cloudflare are two such CDNs. Here’s how they work, they will host your files on several data centers that are spread across the world. So, whenever a file has to be delivered, it is delivered to the visitors from the nearest center. Now this means that load time is getting reduced for people who might be far away from the origin server. At the same time, when you offload your resources to such multiple data centers, you end up reducing the bandwidth consumption on yours. Now that we’ve talked about CDNs, here’s a point to help you get the most out of Cloudflare by changing the settings a bit. The one that we’ll be primarily talking about is Page Rules. Tweak your Page Rules so that it avoids your WordPress admin from Cloudflare. This is actually something that Cloudflare itself suggests in order to make sure that you don’t end up breaking your admin area. And then in the following settings go ahead and select ‘Disable Performance’ and ‘Disable Apps’ respectively. And that’s about it as far as page rules are concerned. Here’s how you can get a report on how well your servers response time is. Head to Google’s Page Speed Insights, put in your sites name and hit analyze. You’ll be provided with a detailed report about your sites response time, highlighting whether it is slow or fast, how much time it takes and so on. Now, if there is scope for optimization, there will be a “reduce server time” option. Another factor that may be considered when talking about server response time is PHP. It is recommended to install a plugin that’ll let you know what PHP version you’re on. If it’s outdated, then perhaps you should upgrade to PHP 7. PHP 7 is known for making websites faster and more secure. But before making the upgrade, make sure that your plugins are compatible with PHP 7. You can use P3 Plugin or GTmetrix Waterfall tab to identify such slow plugins. Themes that are not being used tend to store preconfigured settings in the WordPress database. So, it is best to get rid of all the themes that you have decided to not use. For this, go to the appearances tab and delete those that are unused. Now if you’ve tried everything and are still finding it hard to fix your slow WordPress admin panel, then perhaps turn to this as a last resort. Before going ahead with the following steps, it is recommended to keep a backup of your site. Download the latest version of WordPress. And then go ahead and upload the WP-Includes and WP-Admin to your server by an FTP. Brandon Graves is known for their WordPress development services, presently works at HireWPGeeks and manage the projects for HTML to WordPress and website to WordPress conversion services. Follow on Facebook to get more news from him.